Jason: So what is really going on with the “Transformers”? Are they really more than meets the eye? 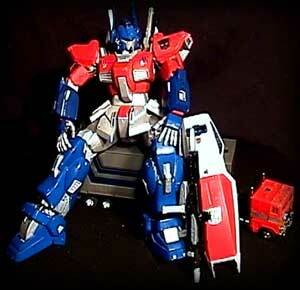 Optimus Prime: Well take a look for yourself…….well?………What do you think? J: Yes, that is impressive. Now could you please put some pants on? J: So what is the movie about? OP: Well, those of you who were fans of the original series will be pleasantly surprised. The new movie will be a musical. J: I am surprised, but not pleasantly so. OP: Just think of it! All singing, all dancing giant robots! J: It all sounds a little terrifying. So how will the Transformers “transform”, if you will? Will there be a lot of CG effects? OP: Oh no, not in this movie. Michael Bay thought it would appeal to a larger audience if there was no transforming at all. He said that all the shape-shifting would only confuse people. Plus, all of the costumes were made out of old appliance cardboard boxes. J: So the movie really shouldn’t be called “Transformers” then. It should just be called “Formers”, right? J: Yeah, thanks for wasting my time. OP: No wait! All of your old favorite characters will be in the movie. Sideswipe, Starscream, Herbie! J: I think Herbie was in a different show. OP: No, wait! Not Herbie. I meant Benji. J: Well I think that will about do it. Thank you for your time, Mr. Prime. I’ll be home watching the original series on Beta.